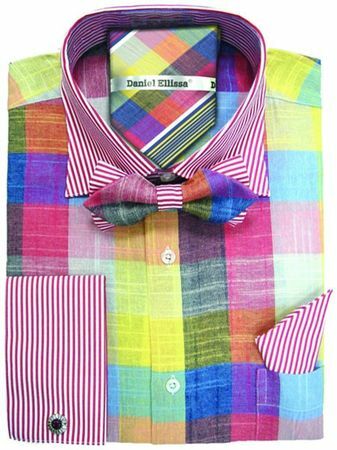 Watch people stop what they are doing when they see you enter the room wearing this bold and outrageous multi plaid pattern shirt and tie set by Daniel Ellissa. The colors have that can not ignore combination and features french cuffs and comes with both a matching bow tie and a neck tie for a nice change up. Made of cotton poly fabric.